If you haven’t heard of the brand Aden + Anais then I am sure you will be familiar with the pale green cartoon birds muslin that Prince George was swaddled in when leaving the Lindo wing in 2012. With their own distinctive style and exclusive patterns Aden + Anais really is the Rolls Royce of Muslins and something that should be on every new parents list! Founded in 2006 by Australian, Raegan Moya-Jones the brand is now available in 65 countries worldwide and includes a full range of multi-purpose swaddles, burpy bibs, dream blankets, sleeping bags, nursery bedding, muslin clothing and more. Raegan scoured the US for the muslin wraps used by parents everywhere in Australia and found the only available options were made of fleece, flannel or heavy cotton—none of which she thought were right for swaddling. That’s when the idea for Aden + Anais was born. 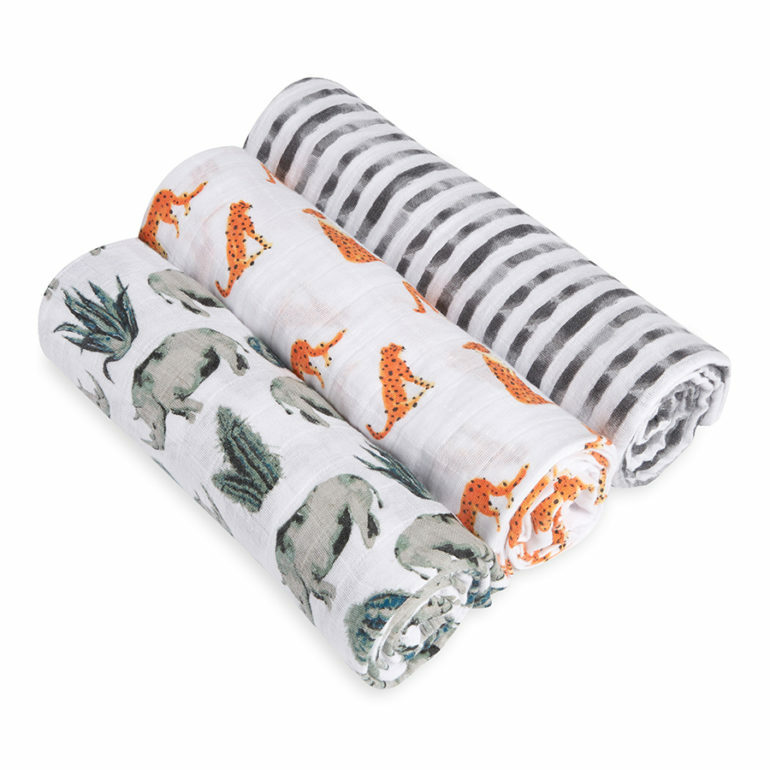 Aden + Anais swaddles are 112cm x 112cm in size, whilst the muslin squares are 70cm x 70cm. The large size of the swaddles makes it easier to swaddle with but it also makes them incredibly versatile. They are 100% cotton and so incredibly soft and gentle on your baby’s skin and they just get softer with every wash. Their absorbent to quickly soak up messes and spills, while the quick drying open weave allows for liberal airflow. One of the most iconic designs is The Jungle Jam 4-pack featuring the Prince George pale green bird, a Monkey, Giraffe and Elephant. It is also available in Muslin squares and the print is unisex so it is the most perfect and practical gift for a new mum. The classic burpy bib also available in the Jungle Jam pattern and is great for keeping your little one clean. The generously sized, absorbent fabric drapes over your baby’s shoulders and snaps at the back for a breathable bib that catches the sneakiest of side dribbles. It also doubles as a no-slip burp cloth with its kidney shape that sits just so right over your shoulder. Recently in the same spirit of innovation, Aden + Anais have launched the white label, a collection created for the modern parent with an eye for design. Born out of the Aden + Anais creative studio at our Brooklyn headquarters, Aden + Anais white label reflects a distinctive downtown vibe infused with a bit of cheeky Aussie wit inherited from our Australian-native founder Raegan Moya Jones. The highly-curated line features a fresh aesthetic with unique watercolour-inspired prints and eye-catching colour palettes. Part of the new white label is the Serengeti range which with my African heritage I am a huge fan of! Featuring a Rhino, Leopard and Zebra print in swaddles, bibs and blankets it really is very unique and sure to make you the envy of your friends.